I LOVE the Twig Blocks that I got PlumGirl as a sorry-we-are-bringing-home-two-babies present. The blocks are beautiful and naturally inspire a lot of different learning activities. 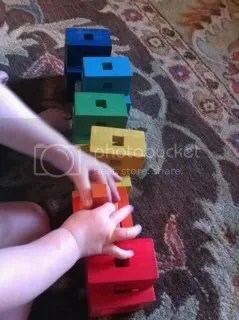 This morning I set up stacks with each of the different colors that we could drop the littlest stick blocks into. At first, I sat and did the activity myself while dictating what I was doing, but soon PlumGirl was interested in joining in. Once she was involved, I gave her just two of the stacks so that she could practice matching just two colors. Her favorite color right now is “juice” (orange) so we sorted with the orange and red stacks. Getting the sticks into the little holes was also great fine motor work for her. It often took her multiple tries to get them in. The activity did not last long, but she definitely “got” the idea of matching colors. 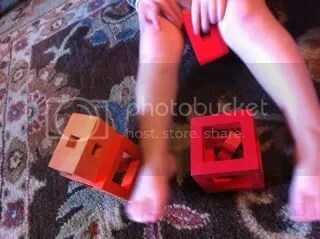 Several times she took a red stick and put it to the orange stack, then she would laugh and say, “No, no!”. We definitely had fun while it lasted.